Popular hearing aid retailers Boots Hearingcare, Bloom Hearing and Hidden Hearing are all owned or part-owned by the brands of products that they sell. Though you might expect to have lots of different brands to choose from when you visit a hearing aid retailer, the range is often be limited to two or three. To some extent this makes sense as a hearing aid dispenser or audiologist naturally becomes experienced and familiar with certain ranges. However, what you might not realise is that the choice of brands stocked sometimes comes down to who owns the shop you are in – and in some cases this is actually a hearing aid manufacturer. We reveal who owns who in the graphic below. Looking for a hearing aid? Find out what you should expect to spend in our guide to hearing aid prices. Eight in 10 Which? members that we surveyed said that hearing aid retailers should make it clear on their website or in marketing materials which products they sell are also made by the retailer or its owner. 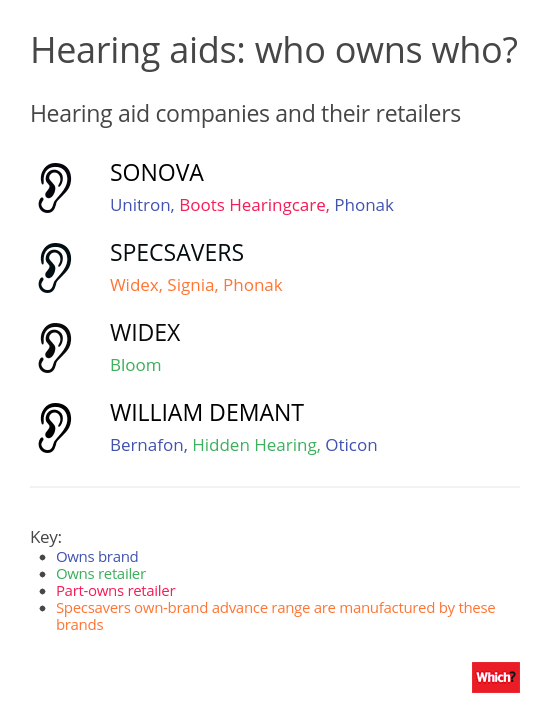 But when we examined the websites of Boots Hearingcare, Bloom Hearing and Hidden Hearing, we couldn’t find anything highlighting the relationship between the hearing aid retailers and the brands they stock on Bloom or Hidden Hearing’s website. Bloom has since updated its site to declare that it is part of the Widex group. You’d have to wade all the way to the bottom of the T&Cs on Boots Hearingcare’s site for an indication of its relationship to other brands. And while the terms do state that it ‘is a company owned in partnership by Sonova AG and Boots UK Ltd’, you’d have to visit Sonova’s site to discover that Sonova AG makes the Phonak and Unitron brands that Boots sells. 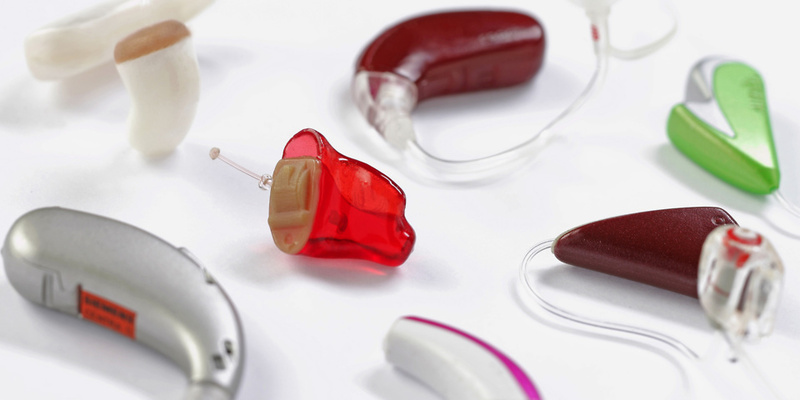 The other main brands – Resound, Siemens and Starkey – don’t own any retailers, although UK Hearing Care, which supplies Age UK’s hearing aid service has a loan from Starkey Laboratories. UK Hearing Care assured us that this financial relationship has no bearing on the products it stocks and supplies to customers. It also confirmed that its audiologists are instructed not to choose one manufacturer over another. There is nothing inherently wrong with manufacturers distributing their products through their own retail chains – a practice known as ‘vertical integration’ – but we do think you should be given all the information needed to make your choice. In reality, some of these omissions of information may simply come from the way that manufacturers have acquired and expanded their retail operations over time, but this doesn’t mean they shouldn’t and couldn’t be more transparent. If you want a particular brand, don’t assume that your health retailer will definitely stock it, and do your research first. Ultimately, though, don’t forget that the products are only a small part of the overall service package you should receive from your optician or audiologist, and if you don’t feel confident in the choice or care you get, seek a second opinion. Related: we reveal who owns who in the world of glasses and opticians. In our research into who owns who in the health market, we also looked into pharmacies. More than half of the Which? 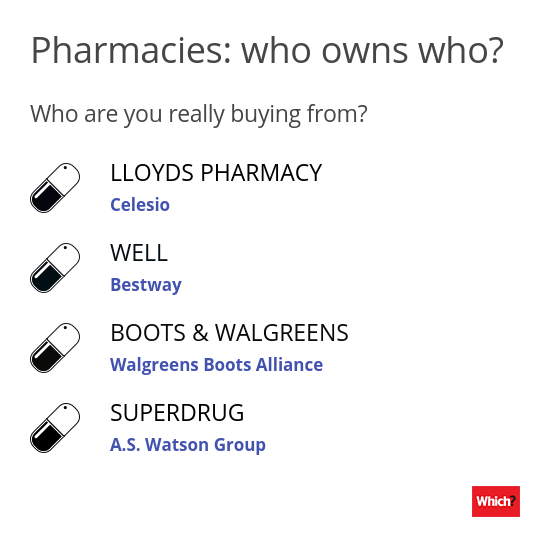 members we surveyed viewed Boots less favourably when they discovered it’s owned by US-based firm, Walgreen Boots Alliance. A third felt similarly disappointed that Lloyds Pharmacy is owned by Celesio, a German multinational that’s controlled by another giant US pharmaceutical company, McKesson Corporation. Well pharmacies are owned by Bestway, the UK’s largest independent wholesale cash and carry, which also owns Best-one convenience stores. And Superdrug is part of the A S Watson Group, based in Hong Kong. In the UK it also owns Savers and The Perfume Shop.